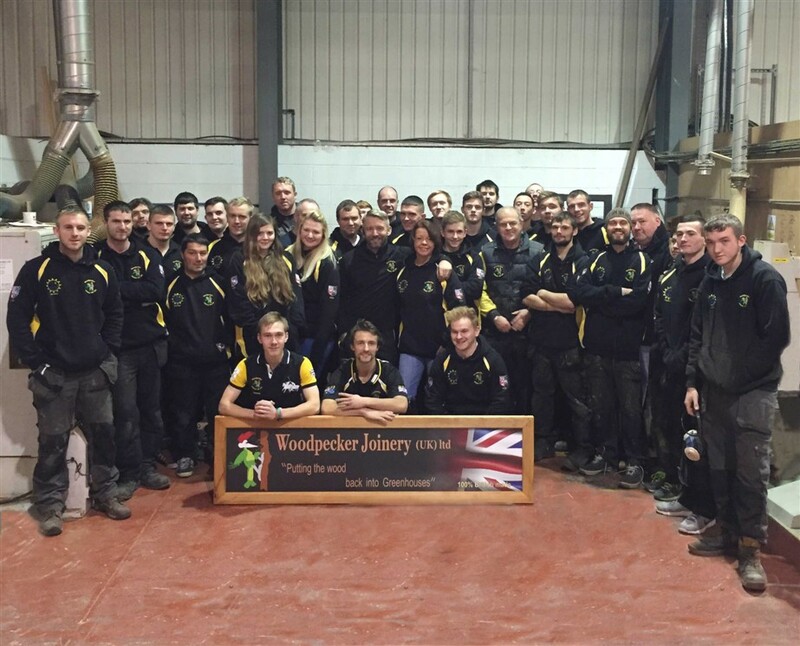 Woodpecker Joinery was founded in 1994 by Christopher Waltho, a dedicated and talented craftsman. From a farming background, an early memory was spending many hours helping his father lovingly craft a wooden greenhouse. His natural and creative flare for design became apparent during Chris’ school days as did his love and interest in working with wood. Chris went on to study woodwork at NVQ level and gained a City and Guilds certificate. Along the way many things added to career development; from serving an apprenticeship at the age of 17 with a local joinery company manufacturing doors, conservatories and windows, and in the engineering field acquiring knowledge of design. A lifelong dream had always been to one day start his own business. After being made redundant from the engineering firm, Chris applied for a Government grant. The application was successful and he became a sole trader based at his mother’s smallholding in Bramshall, Staffordshire. He continued in what he knew best – manufacturing windows, doors and conservatories. During the next three years a reputation for good quality products grew, as did the customer base. In 1997, after being approached by an aluminium greenhouse supplier to provide a bespoke cedar greenhouse, the first Woodpecker greenhouse was produced. Inspired by his creation, market research followed and it became apparent there was a keen British interest in gardening but few companies specializing in Bespoke cedar greenhouses. Chris began to develop a website and engineer a range of cedar wood greenhouses. Orders flowed in and eventually it became too much work for one person. Realizing the need for help he approached his brother Louis, fiancée Louise, cousin Joe and Tom, a family friend. Long hours, hard work and dedication were called for – together we were a strong and determined team. The popularity of our products exceeded expectations; we were full of optimism and looking forward to the future. That was until tragically on Christmas Day 2004 at the age of 20, Joe passed away in a car accident. He is sadly missed and fondly remembered. During summer months we had extra hands on board from University students Bobby, Ross and James, who would help out both in the workshop and installing our products. In October 2005 Joe and, in 2006, Craig joined the team. All of the aforementioned would prove significant in Woodpecker‘s future. Thankfully our success over the next four years continued. After careful consideration a decision was made in order for Woodpecker Joinery to develop and move forward: we would need to move to larger premises. In December 2012, with 30 employees, we moved back to Chris’ roots, purchasing our own premises in Bramshall. Our business has expanded and we sell cedar wood UK wide, having more orders than ever before and the luxury of being in our own premises. We have renovated the office space and workshops. Tom is Head Joiner, Joe Works Foreman, Louis Head of Painting Department, Bobby our Manager, Ross Imports and Exports Manager, Craig Head Site Foreman and James Head of the Technical Department. We continue in the development of young people and training within the workplace. With special thanks to Mary (Chris’s mum) without your patience, time and help none of this would have been possible. Our Company Director, affectionately known as Woody, established Woodpecker Joinery in January 1994. A truly dedicated craftsman, he has designed and developed every aspect of our cedar greenhouses to ensure a fantastic gardening experience for all our customers. A very well travelled Woodpecker, he knows every nook and cranny of the UK, as he’s probably installed a greenhouse there! His interests include cricket and football- he’s been a Rams (Derby County) fan all his life, much to the disgruntlement of our team, the majority of whom are Stoke City fans. Somehow, they still manage to work in harmony! Louise is always smiling and friendly and ensures that everyone is motivated and happy and works hard to help all our clients with any problem- big or small. Louise’s main loves are her four Old English sheep dogs, who certainly keep her occupied! She also loves to travel, with Australia being her ‘spiritual home’. Louise is always game for a good party with friends and is currently using her love of interior design to redecorate her new home. Louis, Chris’s older brother, has been at Woodpecker since the beginning and now works here full time as Head of our painting division, as well as keeping on top of our stock orders and ensuring that everything in the yard is in good working order. Louis regularly goes out to install greenhouses and deliver our accessories, as well as working on finishing greenhouses to a high standard at our workshops in Bramshall. Louis has a young family and is a keen cyclist, having biked all round the UK for various charities. Joe, our Foreman, is possibly the most organised Joiner we have ever seen! He knows exactly what’s going on all the time and makes sure that the others do too. Having finished his apprenticeship, Joe is a key part of the Woodpecker greenhouse and coldframe production team and a very practical, skilled person. Joe leads our Stoke supporters and can often be found at a football match, egging The Potters on. Ross completed his degree in Music Technology in 2013 and now works for us full time in the office, as our Import/ Export Manager and IT guru. As well as looking after our expanding timber imports, he also oversees our worldwide greenhouse exports to Europe and Australia. Ross is married to his wife Sarah and also a dad to Oscar and Alice. He is also a skilled musician, having built his own guitar and is a member of a local band. James completed his degree in Industrial Design at Loughborough University. Having worked at Woodpecker for the last 10 years during School and University holidays, he knows our greenhouses and products inside out, and is now our Design Manager. He is also regularly to be found organizing football and cricket sessions for the lads and enjoys a spot of golf at the weekend. Matt White works on a part-time basis helping with greenhouse show stands. He has just finished his degree in Engineering at University. Tom, our Works Manager has been at Woodpecker now for over seven years. Having completed his apprenticeship he has become a competent and well respected Joiner and has crafted many, many timber greenhouses for installation all over the world. He gets on well with everyone here at Woodpecker and works diligently to provide beautiful bespoke products for all of our customers. Tom is a keen music and film fan and owns an impressive CD and DVD collection, which he uses to relax after a hard day’s work. He is also learning to kickbox, so that he can keep the boys in check! Alan is a family man who works on finishing our greenhouses. He is always willing to work long hours and weekends and gets on well with the whole team. Martin H, is one of our top joiners, has been with us for many years and gets on well with everyone in our team. He’s a quiet lad, but we hope to bring him out of his shell. Tom Vw is another of our workshop joiners. He is renowned for his different coloured flowing locks and is also a bit of a fitness fanatic. James Cox is a wise Woodpecker who makes all of our cedar coldframes, waterbutts and cedar shingle roof. He is liked and respected by everyone here. Martin D works in our aluminium department, he is a friendly chap and gets on well with the whole team. He also makes the best cup of tea at Woodpecker not!. Ollie is one of our site joiners who travels the length and breadth of the country installing our greenhouses. From a farming background, Ollie is another of our car enthusiasts. Callum is Ross’s younger brother and makes all of our cedar greenhouses for export. Outside of work, he enjoys playing in a band and talking for England! Lauren is Louise’s right hand girl and works in the office. Always polite and friendly, her bubbly nature makes her a pleasure to work with! she loves music and cooking.